Hulsey Heating and Cooling, family owned and operated since 1965. Is your furnace blowing cool air in the winter or your air conditioning blowing room temperature air in the summer? Don’t suffer indoors. Allow our heating and cooling experts to help fix your heating and A/C problems in Northport and the surrounding areas. Even if you’re willing to suffer through discomfort, it’s not always the best thing for your HVAC system. The longer you wait to get your system repaired, the more of a possibility that you’re further damaging the equipment. More damage means more costly repairs. Avoid that possibility by getting a professional heating and cooling specialist to your location as soon as possible. Don’t see the service you’re looking for? Call and let us know what you need, and we’ll work with you on a solution. Ready for a new system? We're happy to provide a free estimate on how much it will cost to replace your existing system. Contact us for more information. Keep your home cozy and your business comfortable by maintaining the proper temperature during any season. We take the time to get to know your specific needs and requirements to make sure your have the best possible experience with our contractors. 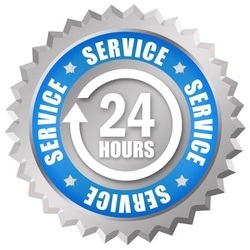 Hulsey Heating and Cooling is proud to offer our customers 24 hour emergency support. No matter the time or day, we'll be here when you need us.